During the hour-long drive from Nogales, we see vistas of wide-open desert, rugged mountains rising up along the horizon, towering cactus plants and yellow traffic signs warning us we are traveling through an open range area. In Arivaca, a desert town of approximately 600 residents that was founded in 1878 and lies a little more than 10 miles north of the Mexican border, we pass a post office, a church and few shops on the main street. We encounter a few birdwatchers and casual hikers as we park our cars at the trailhead. Father Pete gathers us around a picnic table where he places his backpack, and he describes what we hope to accomplish this morning. Our walk in the desert is not meant to be a simulation of the migrants’ crossing the border, rather it’s an opportunity to walk the paths they walk while maintaining an awareness of the difficulties they face. We cannot physically accompany the migrants, so we attempt a spiritual accompaniment. Father Pete empties his backpack, first showing us what the migrants would be wearing and carrying with them in their bags. He hands us each item—fabric shoes that leave no footprints, black plastic water bottles that do not reflect the light of the sun—and notes the ingenuity required to create them. Then he begins sharing what he calls relics. These are personal items left behind by migrants, which he has collected over ten years of walking these trails: a glass bottle of cologne a young man must have used before exiting the desert, a plastic bottle with a Tigger lid a mother must have used to quench her baby’s thirst, stacks of family photographs, and a Bible bearing the message “Dios te bendiga,” inscribed with the date 17/12/03. I am awash with memories of visiting Poland in 1989, where I saw piles of shoes, luggage, and jewelry on display in the concentration camps that were repurposed as museums. Father Pete’s relics are not behind glass, though. He carries them with him, these possessions the migrants brought with them. Holding these things in our hands lends a physicality to the spiritual journey we’re about to take. Father Pete tells us to keep our eyes open for detritus—food and water containers left behind, clothing and backpacks shed when no longer needed. Now he will lead us to the spot where the baby bottle was found. We walk through the dry bed of Arivaca Creek, a seasonal stream that stretches about two miles. Crossing here during the rainy winter months and summer monsoon season could be treacherous, but the only obstacles in our path are overgrown thorny bushes and tree roots. As soon as we step down into the dry creek bed, we see discarded tuna cans and t-shirts on the ground. More ominous are the straps of backpacks tangled in the branches. We have no way of knowing whether the owners of these abandoned items lost their lives passing through this place. Wandering this rugged desert terrain, I take photographs of the expansive sky and the dry earth. 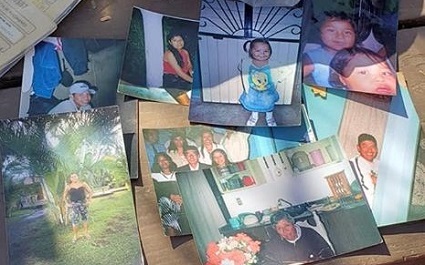 I also stop to examine relics and recall the photographs I held in my hands—of families sitting around kitchen tables, couples dancing and children playing—depictions of the ordinary joys of life. What makes a person leave home, despite the threat of great danger, to seek another life? I think about my own grandfather’s immigration story. My Grandpa Harry, at seventeen, fled his home to avoid conscription in the Russian army. He traversed what was then Red Russia, boarded a ship to Canada, and from Toronto was able to cross into Buffalo, New York. He traveled south to Tuckahoe in Westchester County, and then to Brooklyn, where he eventually settled and worked as a tailor to support his mother, and his wife and children. During WWII, too old to serve in the United States military, he worked as a porter on the Pennsylvania Railroad. My father has his father’s employee identification badge, a copy of his parents’ marriage license and their wedding picture, and a few photographs of his father as a young boy. Grandpa Harry died before I was born, and I was given a variation of his name, in Hebrew and Yiddish; this is how Ashkenazi Jews bequeath the memory of our ancestors to future generations. 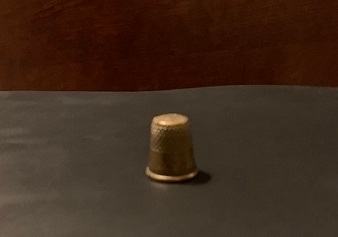 Along with his name, I possess one item he brought with him from the old country: a tiny, metal thimble, which I keep in my bedside table. A relic of my grandfather’s journey to this country nearly 100 years ago. I can’t share the stories of the migrants whose possessions we beheld in the desert, because I don’t know how their stories end. Surely some survived their journeys and, like my grandfather, worked at menial jobs so their children and grandchildren could have the opportunity for a better life in this country. Some were returned to their countries of birth. Some may be crossing the desert again. The story of our migration across continents, deserts, oceans, and seas begins when human beings stand upright and walk on two feet, and it continues today along a circuitous path. The story of migrants arriving in Arivaca and Nogales and Tucson is the story of my Grandpa Harry arriving in Toronto and Buffalo and Brooklyn. It is the eternal story of our human family. Sephardic memory and tradition at Shavuot.